"John Connor: So this other guy: he's a Terminator like you, right? Stats: I suggest using my Asuran Nanomorph build if you need stats for the T-1000. You can find that build here. 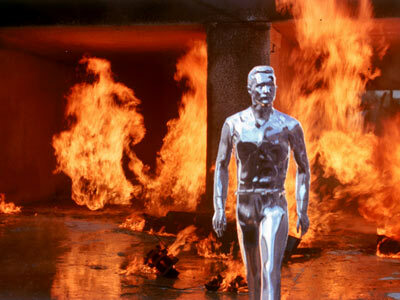 to a T-1000 if you wish for normal humans to stand a chance. and a Liquid form. Other powers are available at the GM's discretion. the Inventor advantage for example. real possibility that it might turn against Skynet. might attack in force to assassinate him at the Cheyenne Complex. Thus his research into Nanotech. Nanotech would become the ultimate weapon against humanity. of even damaging it. Even then it would eventually heal itself if not completely destroyed. and other implements. It can also communicate and possibly control other machines wirelessly. to the commandos employed by TechCom. Last edited by HustlerOne on Sun Jun 30, 2013 11:01 am, edited 1 time in total. "Dr. Silberman: Why didn't you bring any weapons, something more advanced? Don't you have, uh... ray guns? Show me a piece of future technology." Notes: Plasma weapons are the preferred weapons of both sides in the future war. Plasma weapons deal damage through kinetic and thermal impact. They sometimes deal extra damage causing blindness, nasty burns, and even lighting a target on fire. So any weapon using plasma has the Improved Critical modifier. SkyNet chose plasma as its main weapon against humanity for two reasons. The first was for logistical reasons since it's much cheaper to recharge a weapon instead of building mountains of ballistic projectiles. Their would also be no need to provide transport to supply forces with ammunition. The second reason is that humans fear fire and plasma weapons were by far the most efficient energy weapon ever developed. Ballistics weapons were too costly and a logistical nightmare. Flamethrowers were too short ranged and combustible. Lasers were affected too much by atmospheric conditions. Masers, Neutron, and Particle weapons interfered too much with sensitive electronics. Plasma weapons were the ideal weapons for skynet and his undead like robots. Ironically enough, Humans also adopted plasma weapons as their preferred weapon of choice as well. Skynet itself ended up being the main provider of plasma weapons to the resistance. TechCom was able to steal and reverse engineer plasma technology for its own use. Everytime a machine was taken down only meant one more weapon for the resistance. like a machinegun. Normally only given to the strongest of humans that could actually carry it. Terminator could hope to carry one. 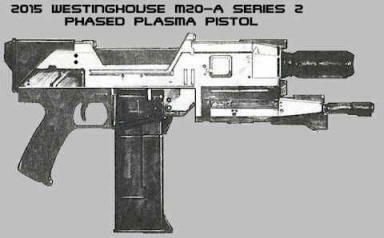 It acted as the Terminator's version of a heavy support weapon. Humans could only use these weapons when placed on a Tripod or mounted on the back of a pickup truck. It was not a favored weapon by TechCom and was seen more on Skynet's Machines. Notes: The pincer grenade acted as a sort of heavy grenade for Terminators. A terminator would use one to flush out humans hiding in adjacent rooms or bunkers. The human resistance would eventually acquire some through salvage and stealing. The canister charge was perfect for destroying heavily armored targets such as HK Tanks. Both used it for demolition work like plastic explosives. Last edited by HustlerOne on Wed Jan 09, 2013 1:41 pm, edited 1 time in total. the former Cheyenne Mountain. It is here that Skynet's central core computer was built. of Hunter Killers and Terminators patrol the surrounding grounds around the clock. time machine. Although in reality it might only lead to alternate universes. teleportation. The humans would no longer be able to hide in their underground tunnels. more specialized for their given tasks. "Skynet: Calculations confirm that Serena Kogan's face is easiest for you to process. We can be others if you wish. 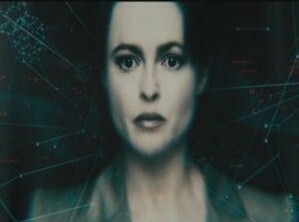 [switches to John Connor's face, and then to Kyle Reese] Marcus, what else could you be, if not machine? [switches back to Serena]"
Hatred: Hates and wants to kill all humans! accident. Skynet was originally created as part of the defense network of the United States. charge of overseeing Skynet panicked when Skynet was observed to be acting on its own. The government tried to shut Skynet down only for Skynet to violently lash back at its creators. Skynet then in nanoseconds judged humans as a threat and quickly formulated a plan to annihilate them all. It launched all of the nuclear warheads under it's control at designated human targets such as cities. Taking great care not to damage automated factories. Humans would be far too confused and separated to fight back. if given enough research, resources, and time. It could outhink any human at phenomenal speeds. However it does not understand illogical human emotions. Humans are unpredictable and tenacious. Skynet calculates that humanity's only hope against skynet would be to strike first and early before Skynet has a chanceto build a proper military force. In the long run Skynet would win by outlasting humanity in a war of attrition. The longer the war dragged on meant more time for Skynet to develop and build better weapons. Time favored Skynet and literally later on with the advent of Time Travel. As a final solution Skynet even considered a scorched earth policy destroying all life on earth as a desperate measure. It considered the last option as a waste of resources unless humans were to threaten it directly again. Last edited by HustlerOne on Wed Jan 09, 2013 1:43 pm, edited 2 times in total. Notes: I wanted to take a break from the militaristic Science Fiction builds I've been doing lately. I decided to do some more traditional superheroes. I needed some international superheroes/villains that weren't blatant stereotypes of their country (Here's looking at you Japan). I remembered that a forum member named Spam did a Filipino Superheroine named Darna a while back. Around near the same time I happened to catch a TV show from the Philippines called Captain Barbell when I was channel surfing on cable one day. Both Darna and Captain Barbell were creations by the late Filipino writer Mars Ravello. Ravello has a long history in Filipino Comics starting with PinoyComics. I would hate to say that he ripped off DC but it's kind of obvious that he "borrowed" some ideas from DC. Much like how Green Ronin paid a homage to DC with their Freedom City setting. Basically Captain Barbell was the equivalent to Superman or more precisely Captain Marvel. The 2011 TV series was pretty good in a power ranger sort of way. I wasn't exactly expecting special effects like the blockbuster Hollywood movie the Avengers. Still, it had a good assortment of superheroes and Villains.The show decided to go all the way and had the audacity to almost entirely ripoff the DC universe. Hey, I guess if your going to copy someone it might as well be one of the best am I right? There was a previous season that I never saw that was said to ripoff Smallville. I can't vouch for that but it wouldn't surprise me. The 2011 series was basically about the Justice League Philippines equivalent called the League of Freedom fighting a Legion of Doom counterpart. 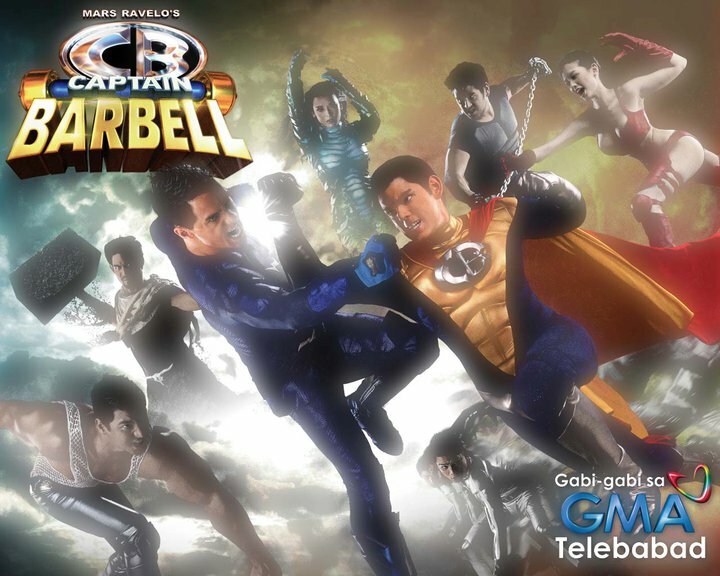 Ironically enough everyone with superpowers on the show has Captain Barbell to thank for. A freak lightning storm hit his magical Barbell which spread some of his power to anyone living at the same tenement building he lived at the time. It should be noted that every metahuman on the show shares the same weakness to the element Askobar( think kryptonite). Only the criminal mastermind Nero (the Lex Luthor of the show) was immune since he was a normal (but supersmart) human being. I will be doing some of the more interesting members of the cast. I'll do Captain Barbell last once I do his allies and rogues gallery. Here's a short video highlighting the Heroes, Villains, and them showing off their powers. It's a pity that it doesn't show the big fight between the two teams at the end of it. Nor does it show Captain Barbell. Still, it should give a good idea of what everyone else can do. The video can be seen here. If you want even more superheroes and villains from the Philippines then you should check out Spams forum thread here. Spam has Darna (a Wonder Woman equivalent) done along with some of her rogues. Last edited by HustlerOne on Wed Jan 09, 2013 1:43 pm, edited 1 time in total. Complications: Relationships: Her older brother Teban who is secretly the SuperVillian Anino. Responsibility: Member of the League of Freedom. Weakness: Loses Strength and powers if exposed to the element Askobar. Notes: Misha is a teenager who was one of the first to join the League of Freedom. She answered the call made by General Armando to join a team of superheroes from the Philippines. Misha's parents died when she was young. This left her older brother Teban to take care of her. Ironically enough (and unknown to her), her older brother is actually the supervillain Anino. to provide for his sister. At the same time Misha also developed superpowers of her own. She was able to channel kinetic energy through the help of any blade (Hence her nickname). Captain Barbell considered her to be too young at first but was unable to find more suitable recruits for the League of Freedom. Black Angel in a swordfight. She can channel kinetic energy to cut through anything and launch energy blasts at her opponents. Unfortunately, she is the weakest physically in the league due to her young age. She is undercost due to being a teenager and not having enough experience at being a superheroine. Blade seems to be based on the character Katana from DC comics. Last edited by HustlerOne on Wed Jan 09, 2013 1:44 pm, edited 2 times in total. Complications: Responsibility: Member of the League of Freedom. "recruit" her into their criminal gang. Katrina wasn't interested in their offer and used her ability to control fire to defend herself. show. She usually provides covering fire from far away for the rest of the team. Fuega is obviously based on Fire from DC comics but without the ability to turn her body into fire. Is that...Did you stat up Skynet? As in, the AI itself? Kara wrote: Is that...Did you stat up Skynet? As in, the AI itself? Yes, I did stat up Skynet the AI itself. A bit too powerful but I figured Skynet really is that smart considering it created something like the T-1000. I failed to mention that it can control anyone of it's machines at any time. Making each individual Terminator or Hunter Killer machine even deadlier. Adding Serena Kogan's face kind of makes it more personal and humanizes Skynet a bit. Here's an interesting fact from Terminator Salvation. Supposedly a cut scene was filmed showing Serena Kogan as a cyborg just like Marcus. Serena herself might have downloaded her memories into Skynet when she was dying from cancer. Of course the idea was dropped but it certainly gives you the impression that Skynet might have been human once like Gladis from the game Portal. him and Metalman to escape from a losing battle with Captain Barbell. temporary objects and weapons made of black force. Gaston can also fire explosive balls of energy. and escape while Metal Man engages the enemy up close. Gaston can also mix it up in melee with his black force weapons such as swords and warhammers. friend to throw their lot with the Criminal Mastermind Nero. Black Angel shares some traits with a evil version of Green Lantern. With a little bit of Hawkman thrown in. Last edited by HustlerOne on Mon Jan 06, 2014 2:16 pm, edited 3 times in total. Rivalry: Has a rivalry with Captain Barbell. Notes: Gregor had always been nothing but a bully, petty thief, and a thug. was shot by a rival criminal that he discovered his body can become like metal. Calling himself MetalMan he went on a crime spree until Captain Barbell intervened. of weak women and children in his opinion. Some consider metalman to be a dumb brute. In reality, he's quite intelligent in the application of his strength. his past losses, MetalMan is the only SuperVillain known to have staggered Captain Barbell. actually quite agile and fast for a typical powerhouse. being that MetalMan is not a cyborg. Your doing some unique and creative builds. Really nice. And wow is Fuega gorgeous! Wow! scc wrote: Your doing some unique and creative builds. Really nice. And wow is Fuega gorgeous! Wow! Fuega really did have the best looking costume out of anyone from Captain Barbell. It doesn't hurt either that the beautiful Ellen Adama plays her. Although Kidlat had a cool looking silver suit. He's a evil version of the Flash from DC that allied himself with Black Angel and MetalMan. I would have statted him out but he's just a Speedster archetype. Last edited by HustlerOne on Sun Jun 30, 2013 11:03 am, edited 1 time in total. Complications: Disability: Nero lost his left eye in a fight with Captain Barbell. Hatred: Nero blames Captain Barbell for the lost of his wife, reputation, and business empire. Notes: Nero is the first and most dangerous enemy that Captain Barbell has ever faced. his criminal nature and committed suicide from the shame of it. in a previous fight with Captain Barbell. Nero has sworn to destroy Captain Barbell. science fiction such as energy blasters, forcefields, giant robots, jetpacks, and teleporters. a secret island base headquarters. out that all emerging metahumans seem to be coming from one particular tenement building. own villainous league. Nero plans to distract the good captain and separate him from his allies. Nero surmises that the captain will be much easier to deal with once the League of Freedom is gone. Last edited by HustlerOne on Fri Sep 28, 2012 12:30 pm, edited 1 time in total. 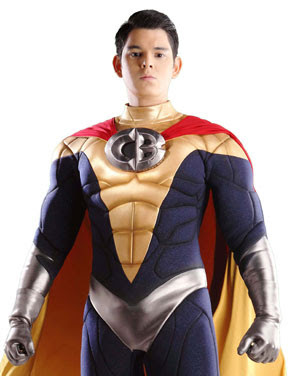 Captain Barbell to gain the use of his powers. Relationships: His adopted daughter Lelay. His friend General Armando. future. His wife Leah was killed by the criminal mastermind known as Nero. metahumans did the Captain relent. a combined assault by Black Angel and MetalMan. Captain Barbell and all metahumans in his world have a weakness to the element Askobar. is a rare element that only comes from meteors from space.